A really nice hostel in the Old Town is Quito. Very social atmosphere and easy to meet new people. Showers are great and beds are really comfy. Meals are available at a very reasonable price and are 100% worth the money! Best hostel food I’ve ever had! This hostel is wonderful! Super comfortable beds, great atmosphere and staff, and there’s a travel agency right next door that helps you plan what you want to do! The only downside is the WiFi is not good in the rooms, but besides that I would highly recommend this place to stay! Highlights: deliscious (healthy!!) food, but a little overpriced. Best f*cking showers ever, not just hostel-wise. Lots of communial areas, great balcony and roof. Only complaint is there aren’t any outlets near the top bunks. One of the nicest hostels in South America! Due to the layout felt like a sociable home not a hostel, great showers and bathrooms and comfortable common areas. Rooftop was amazing! The area is not the safest and felt super quiet after 9pm so take taxis if going alone, on the plus side there’s a cheap and cheerful mercado literally right next door. WiFi was very patchy but amazing breakfast and the staff were the dream! 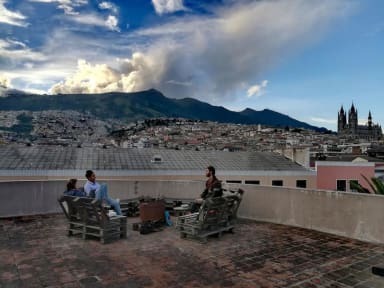 Nice hostel close to the old town of Quito. Has a common room, a kitchen and a rooftop (which wasn’t used much because of rain season). Offers a lot of activities and has its own travel agency. Clean bathrooms and warm showers. Every time I’ve stayed at a Community Hostel, there’s been some kind of issue. This time, when I arrived there was no WiFi and no gas so the kitchen was unable to be used. Staff took their time replacing the gas tank (till next day around dinner) Super annoying as I only had one night and bought groceries to cook. Location was good. Lots of activities. Excellent food.